In Italian coffee bars and cafes, ordering an orange juice (spremuta) means that the counterman pulls out a few ripe oranges, juices them before your very eyes, and hands you a brimming glass atop a saucer (see left, taken at the Castroni cafe/store on via Nazionale, 71 in Rome). The equivalent of a few dollars gets you a gorgeous, midwinter glass of blood orange juice, served with a spoon for adding a bit of sugar. Sadly, the Italian attitude toward juice is uncommon in the U.S.; good luck finding a glass of fresh-squeezed anywhere other than a juice bar (and don’t try to add a little sugar at a juice bar, either). Otherwise upscale, ingredient-conscious restaurants often pour industrial, overly sweet orange juice at breakfast & brunch. But my juice longing is no longer unrequited: after five years of patient cultivation, I’m now harvesting my own Moro blood oranges. A fresh spremuta is a breakfast or afternoon treat within my grasp once again! Hurrah…now on to the juicing. Just three or four oranges juiced by hand on an antique, pressed-glass reamer convinced me to buy an electric juicer. One trip to Bed, Bath, & Beyond (what or where, exactly is the Beyond supposed to be, anyway?) and a 20% coupon later, and I now own a shiny Breville Juice Fountain Plus. 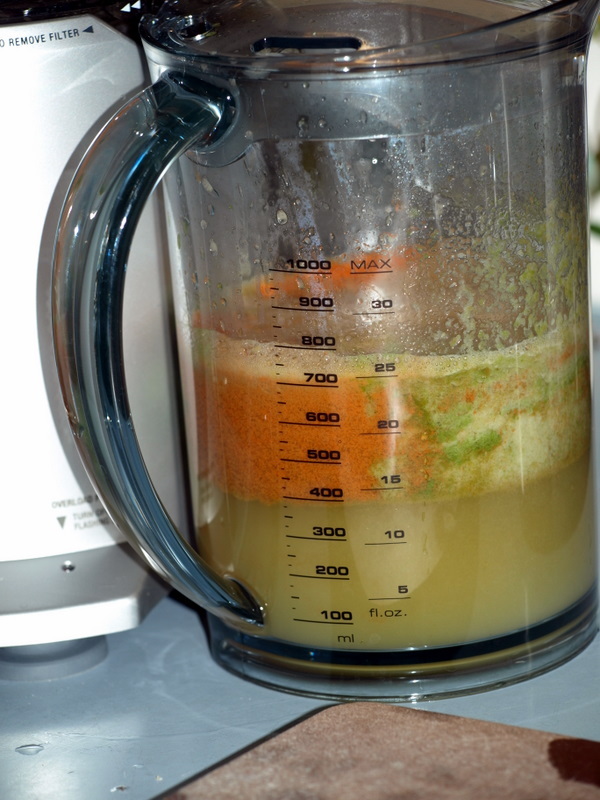 Fountains of fluid do flow from this powerful, two-speed juicer (high for hard veggies, low for softer fruits). No more feats of hand-strength-endurance required: all you have to do is peel the oranges, shove ’em in the widemouth feed tube, and let ‘er rip. The 13,000 RPM shredding disk makes short work of citrus, and the juice ejects right into a plastic pitcher. Like all noisy power tools, the juicer is fun to operate. I quickly began casting around for other juice-suitable stuff. Carrots, ginger, parsley: yum. Sweet potatoes: not so much, kinda starchy on the tongue. I even tried out the “Veggie Detox” recipe from p. 63 of the February issue of Bon Appetit, consisting of pears, ginger, carrots, celery, parsley, and lemon juice. 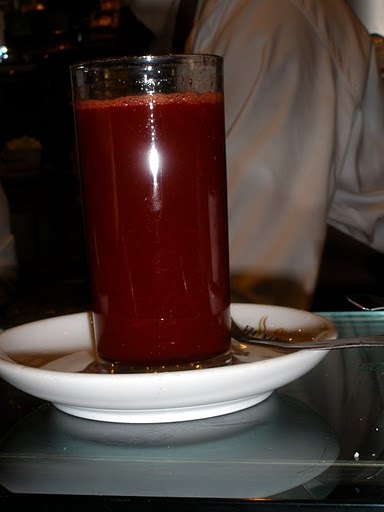 I didn’t have the recipe-specified beets, so the color was bit pale and greenish-peach (see above, in the pitcher). Next on my juicing list: kale, cabbage, garlic chives, and (of course) more blood oranges. 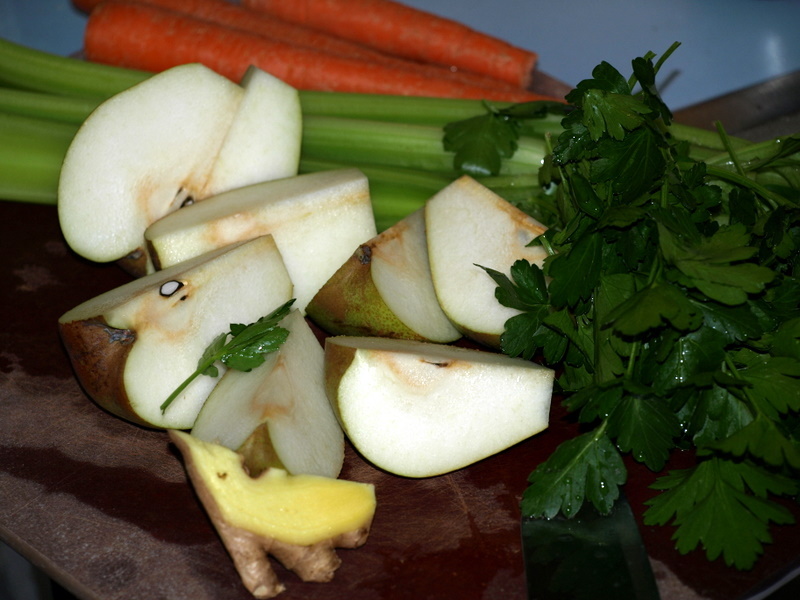 Give two green apples, a couple stalks of celery, half a cucumber and an inch or so of ginger a try. Definitely a great wake up, especially as you up the ginger. Sounds like a good combo; I like ginger in almost anything.